It wasn’t long ago that we heard about the imminent demise of one of the net’s most infamous and venerable sites: Geocities. At the time, we could see the pendulum hanging from the rafters, but earlier this week it was set a-swinging and the site will die quietly and gallantly on October 26th. Of course, while the sites will no longer be accessible at Geocities itself, they will be preserved in our hearts — and on the Internet Archive, of course. But merely being not deleted is hardly an honor fit for one the original pillars of the internet. Although we (and you) created a modest tribute, it deserves more, being one of the primary crucibles (or petri dishes, depending on your point of view) for internet culture. 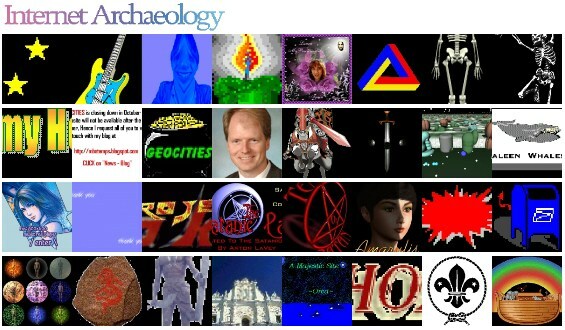 Enter Internet Archaeology, a site established in order to “explore, recover, archive and showcase the graphic artifacts found within earlier Internet Culture.” Artifacts is the perfect word, isn’t it? And as eye-searing as many of them are, there is a kind of transcendent quality in them to the sympathetic eye, and the site is dedicated to preserving that. Spend a few minutes browsing through the already-impressive catalog of images (or catch highlights in the blog) and you begin to be rather a connoisseur in them, and to give a certain grudging regard. After all, making those 3D text animated GIFs was no cake walk in pre-millennium days. There is, of course, a community aspect, where anyone can upload and share their internet oddities, provided they’re SFW and relatively small (it looks like). Entire pages are hosted as well, from outright craziness (my favorites) to sci-fi web rings to personal pages left for dead. These standouts represent the prehistoric relatives of our modern blogs and forums, so tread lightly on these, their graves. There are even original works recontextualizing (never thought I’d use that word without irony) the content in… well, in ways. The creator, New Yorker Ryder Ripps, noted that the total space being used by Geocities pages was perhaps as little as 3TB. Of course, when you put that in GIF terms, that’s a huge amount of content. While panning for gold in the twilight of Geocities is an important job, the intent of Internet Archaeology isn’t just to be a bucket for animated GIFs. The Internet Archive has already saved them from oblivion. The difference is that IA is curated in a serious way; the object is to capture the quintessence of the period by providing the most telling samples. If any readers have been to (and comprehended — the one does not follow the other) The Museum of Jurassic Technology, they might sense a similarity. Singly, each “exhibit,” as we may as well term these gifs, pages, and collections, is hardly worth a second look. But together, like the Wonder Twins or Planeteers, they are able to create something greater: a synthesis of the mindsets in this incredibly important, yet sadly garish and bizarre, period of internet history.